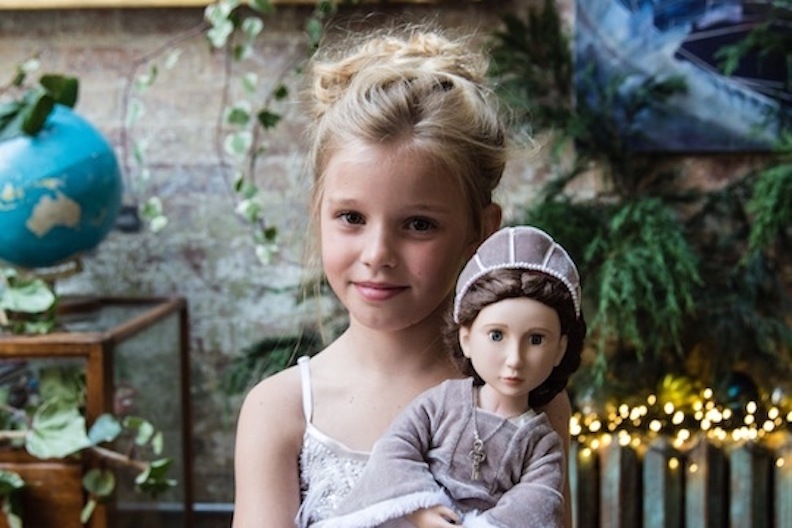 A Girl for All Time introduced new doll Bex this week. She embodies the dreams and demeanor of a contemporary London girl. The approach of summer often means people letting down their guard and wanting to pursue nothing more than vegetating in the sun, armed with a cool drink in one hand and a pair of earbuds blasting the Top 40 directly into their skulls. Quite a serene, seasonal image! Yes, summertime frequently equals a more relaxed and less stressful schedule (fingers crossed), and that normally leads to happier and more sociable days and nights. But is this notion of being carefree, content, and childlike a total lie? Could it be that children, more and more, are feeling nervous, anxious, and under pressure? What can a doll do about this? According to A Girl for All Time, the answer is plenty! And there are two brand-new dolls to help in this digital dilemma. 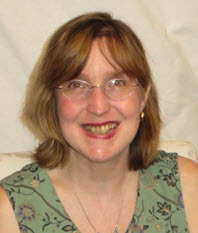 A Girl for All Time (AGAT) was founded by ex-pat Frances Cain. Having left America nearly a quarter century ago, the enterprising businesswoman has resided in Italy, the Netherlands, and now in Britain. Having that global perspective is a key ingredient for Cain and the doll line that she has so lovingly pieced together. 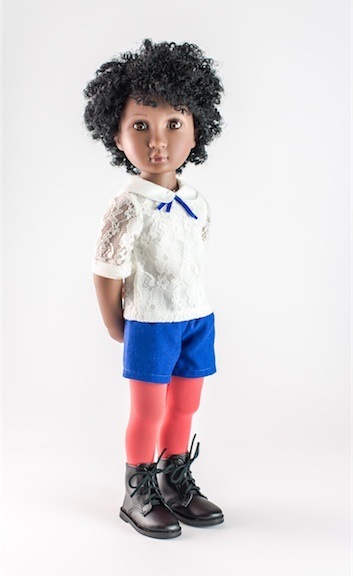 Her dolls and their backstories cross the Atlantic to reflect children who have hyphenated heritages. 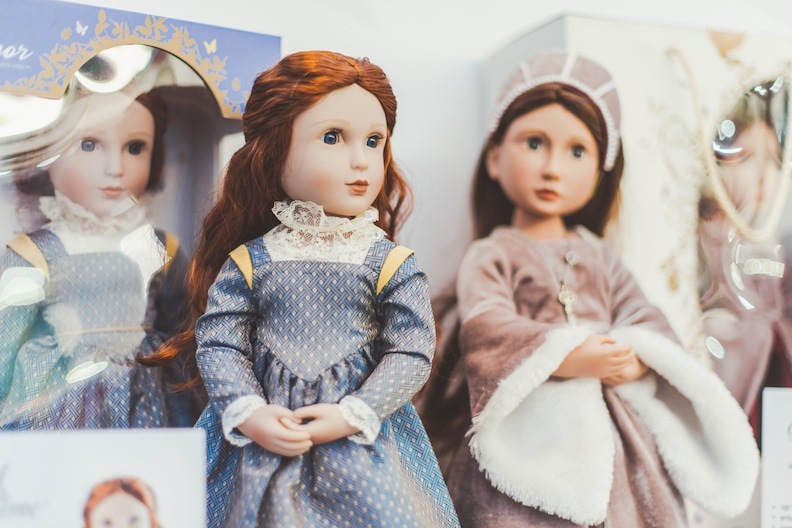 Many of her characters travel to the United States to have adventures and live with family members; other doll creations are the descendants of English aristocracy and historical trailblazers. 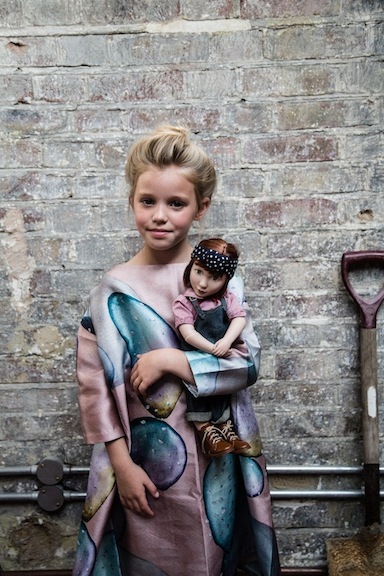 Her dolls are scions of multigenerational, dramatic dynasties. They are akin to cast members of a PBS costumed, sprawling epic! 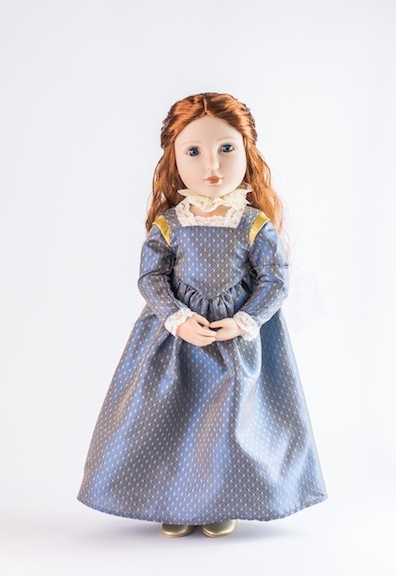 Elinor is one of the two new dolls that debuted the first week of June 2018. A Girl for All Time encourages girls to open up their minds to imagining, learning, and pretending. Cain is sooooo right. When I go out to restaurants with my family, I am stunned by the number of people who do not converse with one another. Rather than catching up on the latest news in their lives, they all have their faces buried in their cell phones, busily swiping their screens and “liking” the postings of strangers. Yep, smartphones have in many ways made us all dumber, or at least less conversational, talkative, and engaged. Now, how has A Girl for All Time come to the rescue? A Girl for All Time offers options for every girl; there is sure to be a time period she embraces. A Girl for All Time allows girls to bond with their playtime counterpart. A Girl for All Time is constantly expanding its line, and with an eye aimed toward the past, and a head nod to the present, it will not run out of long-ago heroines or contemporary characters. It has its feet planted on both sides of the time-space continuum: celebrating the past, the present, and the future. Just this week, two new dolls have emerged from the AGAT studios. Bex is part of “Your Modern Girl” collection. 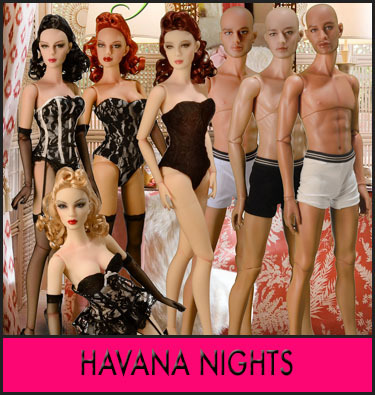 “This is a contemporary collection that focuses on a group of characters who are all best friends and live in modern-day London,” Cain told me. Bex is the epitome of a current London child. Her backstory is compelling. Bex is a truly relatable character: she’s 12 years old, her real name is Becca (but her pals call her “Bex”), and her three brothers drive her up the wall! Her best friend is named Maya, and they spend countless hours rollerblading together. In fact, the two girls take part in a roller-hockey team. Academically inclined (she loves to read and to write poetry), she dreams of being the drummer in a rock band! Bex is a A Girl for All Time and for all interests. Current children will identify with her home life and her aspirations. Elizabethan Elinor has been released in June 2018. She represents a brave and forthright girl of the 17th century. The tableau that serves as the backdrop for Elinor’s life and times includes the Globe Theatre—the home base for the wit and wisdom of William Shakespeare — as well as a supposedly haunted castle. It is the stuff that dreams are made upon—to paraphrase the Bard! There’s always been a palpable sense of theatricality and pageantry to the dolls that populate A Girl for All Time. Combined with their spot-on garments, their chapter books and novels, they do factor as lovely, literary works of art. Many members of the AGAT creative team hail from the British television and film industry. 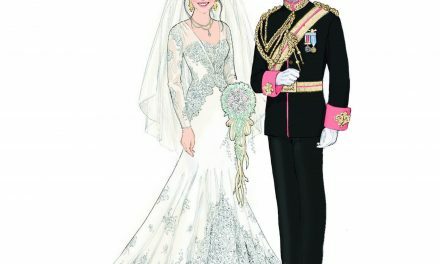 They have won BAFTA awards (the English equivalent of the Oscars) for costume design and script writing. 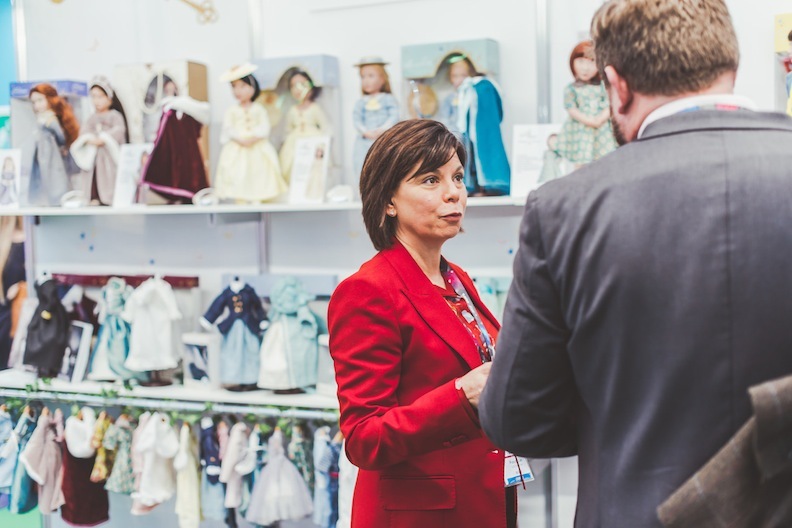 The costuming for A Girl for All Time dolls has garnered many awards and accolades. Following in that triumphant record of cinema and TV accolades, the AGAT team has scooped up tons of toy and doll awards: the Oppenheim Toyportfolio, Doll Reader’s Play Doll of the Year (two years running), the DAE (Dolls Award of Excellence), the Creative Child Preferred Choice award and Gold Seal, among many others. Every girl will find A Girl for All Time doll that fits their lifestyle and interests. 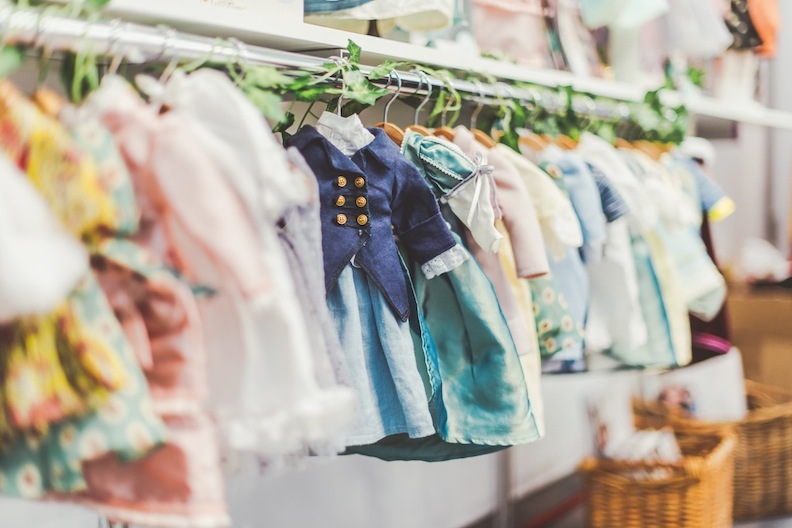 With her ever-expanding doll line that has traced the triumphs and travails of a British family over a 400-year span, she has achieved what she set out to do. 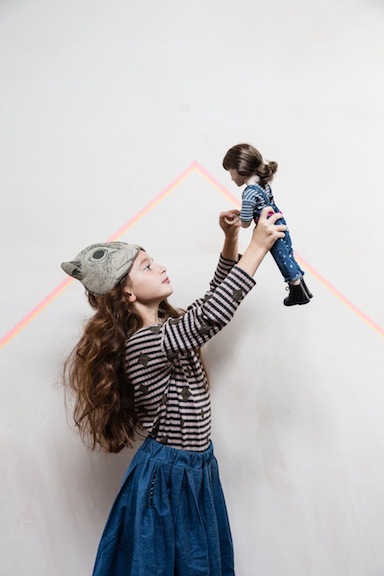 Even more, she has set a standard for other doll manufacturers, collectors, and the children who play with dolls these days. 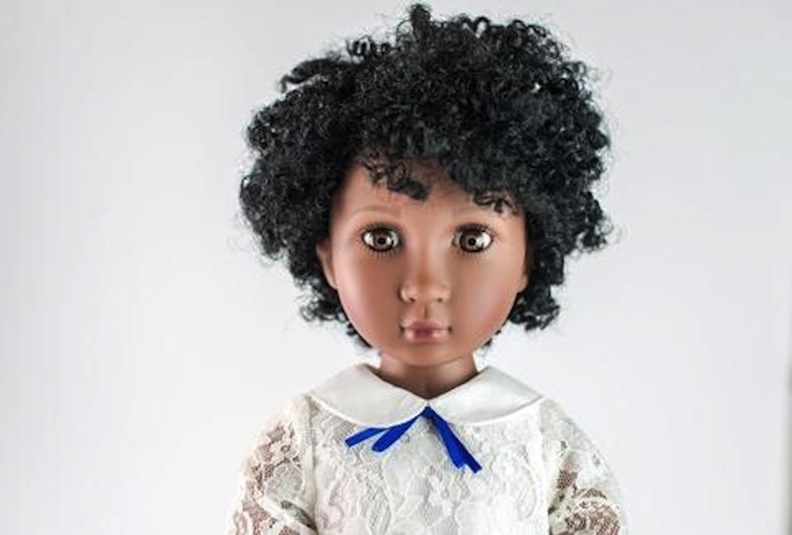 She has taught them that the past does matter, and some of the simpler pleasures from yesteryear (i.e., dolls powered by imagination) help to build better-adjusted, better-socialized, and better-educated women for tomorrow.